After the initial diagnosis of cancer, the next morbid news patients must deal with is the approximation of life expectancy and how well they can expect to respond to chemotherapeutic interventions. These estimates are historically based on precedents set by previous cancer patients. Yet, what if there were a way to improve the accuracy of doctors' predictions, based on personalized genomic profiles? A new method developed by investigators at UCLA could eventually lead to a way to do just that, using data from patients' genetic sequences to produce more reliable projections for survival time and how they might respond to possible treatments. The new technique is an innovative way of using biomedical big data—which gleans patterns and trends from massive amounts of patient information—to achieve precision medicine, giving doctors the ability to better tailor their care for each patient. For this study, the UCLA team looked at cancers of the breast, brain (glioblastoma multiforme, a highly malignant and aggressive form and lower grade glioma, a less aggressive version), lung, ovary, and kidney. The new method the researchers employed analyzes various gene isoforms—combinations of genetic sequences that can produce an enormous variety of RNAs and proteins from a single gene—using data from RNA molecules in cancer specimens. That process, called RNA sequencing, or RNA-seq, reveals the presence and quantity of RNA molecules in a biological sample. The UCLA scientists stated that SURVIV was the first statistical method for conducting survival analysis on isoforms using RNA-seq data. They identified some 200 isoforms that are associated with survival time for people with breast cancer; some predict longer survival times, others are linked to shorter times. Armed with that knowledge, scientists might eventually be able to target the isoforms associated with shorter survival times to suppress them and fight disease. In contrast to conventional wisdom the UCLA team found that isoform ratios provide a more robust molecular signature of cancer patients than overall gene abundance. 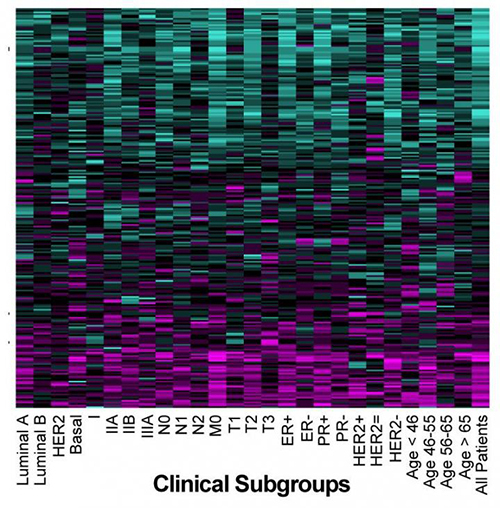 “Our finding suggests that isoform ratios provide a more robust molecular signature of cancer patients in large-scale RNA-seq datasets,” noted senior study author Yi Xing, Ph.D., a UCLA associate professor of microbiology, immunology, and molecular genetics. The researchers examined tissues from 2,684 people with cancer whose samples were part of the National Institutes of Health's Cancer Genome Atlas, and they spent more than two years developing the algorithm for SURVIV. However, the team is looking toward future studies that will incorporate even greater numbers of patient samples.